Thanks to its highly resistant steel structure, timeless style and cost-effective design, the Solstice above ground pool has it all. 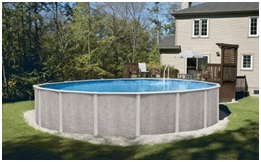 Enjoy your summers like never before with the Solstice pool. Price includes: Liner, pump/filter, 3 sand, vacuum head, thermometer, leaf skimmer, 30' vacuum hose, brush, skimmer, test kit, inlet, 8'-16' pole, 2 hose adapters, skim vacuum and test strips.